Are there any Aztec inventions that are still in use in the world today? It's actually a tricky question, and it depends on what you mean by "invention". The truth is that the empire of the Aztecs introduced many things to the world. But they weren't so much unique innovations as they were things they took from the peoples that they had conquered - things that had been around for hundreds even thousands of years. When the Aztecs met the Spanish, the two cultures introduced a lot to each other. In this new era, the peoples of Mexico were introduced to things like onions and horses, and the Europeans were introduced to... well, that's what we're going to talk about. You might not think of this when you think about Aztec inventions, but the empire was one of the first places in the world to have mandatory education for everyone. In the years ahead, education was going to become more and more important around the world - but the peoples of the Aztec empire were on the cutting edge. Many countries had education for the upper classes, but for the Aztec education was important no matter what your gender, rank or station. Read more about growing up Aztec here. This "Aztec invention" really came along long before the time of the Aztecs. However, it was the Aztecs that introduced it to the rest of the world. Groups such as the Zapotec (of Mexico) and Moche (of Peru) popped their own corn long before the days of the Aztecs. But when the Spanish arrived, Hernan Cortes saw popcorn for the first time. It was used as an ornament on headdresses, and to adorn their god Tlaloc, the god of maize and fertility. The Spanish wrote that the Aztecs had "a kind of corn that bursts when parched and discloses its contents and makes itself look like a very white flower". Read more about this one of the Aztec inventions (again, not really invented by the Aztecs, but popularized!). We can thank Mexico for introducing chocolate to the world. I'm very thankful. Chocolate was highly valued in the Mayan culture - it was actually used as currency. The Aztecs valued the cacao bean as well, and demanded it be a part of tribute. Then they created something that would really make history - xocoatl (a word meaning bitter water), which was similar to drinks the Mayans had made before them. 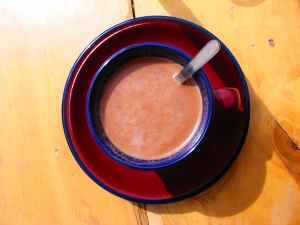 This was a spicy hot chocolate drink that was popular among the upper classes. It was actually a mix of cacoa beans, corn flour, water and chillies! This would evolve into a number of hot chocolate drinks. When the Spanish came, they introduced the wonders of sugar. And so this evolved into the hot chocolates and mochachinos that are enjoyed around the world today. Now that's an Aztec invention worth noticing! The bane of every school janitor was discovered by more than one culture in the new world. The Mayans, for one, discovered that they could take the thick milky liquid from the sapodilla tree (an evergreen) and harden it into gum. The liquid was "chicle", a word you can still hear on street corners in Mexico from vendors selling chewing gum. When the Spanish arrived, they found Aztec prostitutes on street corners chewing gum. The Aztecs had chicle trading routes in place, which were promptly destroyed by the Spanish. The gum became a memory, until it started coming back 350 years later. 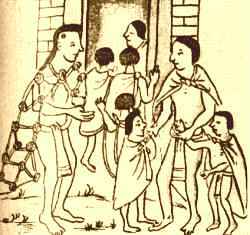 The Aztecs practised advanced medicine. They used a type of antispasmodic medication - medicine that could prevent muscle spasms and relax muscles, which may have been helpful during surgery. The Passion flower was used for this purpose, a flower which still grows in Mexico today. The passion flower is still used today as an herbal remedy, believed to help with insomnia, epilepsy, and high blood pressure. Is there an Aztec invention that you think should be included here? Contact me with your suggestions!